The National Traffic Safety Committee has announced 20 hotlines to receive complaints about traffic problems during the 2018 New Year holiday and the following spring festivals. Citizens having complaints about issues relating to road traffic can call seven mobile numbers of 0983608989, 0916608085, 0903479808, 0915908085, 0915969900, 0964045445, and 0962665953. Those who have problems regarding railway are advised to use the hotlines of 01676623357, 02438220424, 02363820444, and 02835262959. Meanwhile, reports on issues in inland waterways can be conveyed to the hotlines of 0243548188 and 0942107474. The hotlines for problems regarding traffic safety and accidents are 0868911911, 0977497897, 0989088719, 0941329634, and 0936198387. Reports on airways-related issues can be conveyed to 0902999655 while the Department of Traffic Police will receive reports on violations of traffic rules and traffic jams via 0692342608. Traffic accidents rose sharply during the Tet holiday last year, killing 203 people and injuring 417 others in 368 incidents. 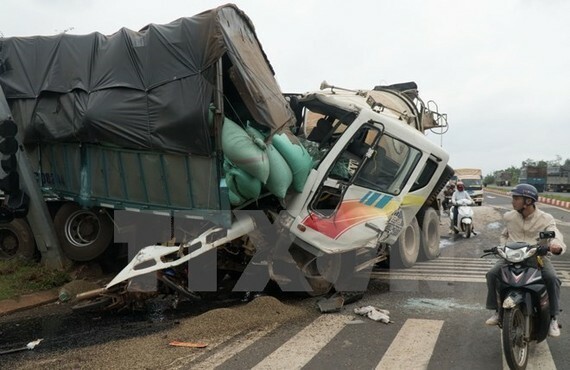 Road accidents accounted for 97.8 percent (360) of the total incidents, 97 percent (197) of the deaths, and 97.36 percent (406) of the injured during the holiday from January 26 to February 1. There were eight railway accidents, killing six and injuring 11 people.